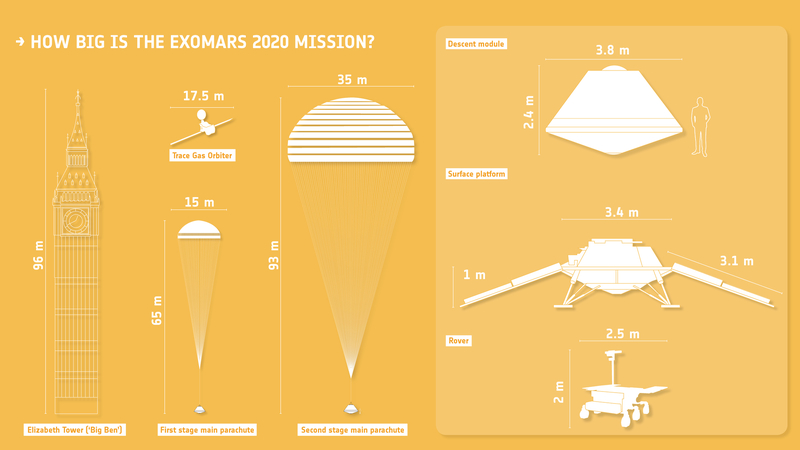 ESA - Robotic Exploration of Mars: How big is the ExoMars 2020 mission? Sizes of key components of the ExoMars 2020 mission. The parachutes that will help slow the descent module through the martian atmosphere are compared in size to the iconic landmark of Elizabeth Tower ('Big Ben'), in London, UK. The descent module, which will deliver the surface platform and rover to the martian surface, is compared with the height of a human. The rover is stowed inside the surface platform, and will drive off one of the two ramps that will be deployed after landing. The ExoMars Trace Gas Orbiter, which launched in 2016 and is already in orbit around Mars analysing its atmosphere, is also included in this graphic. It will relay data from the rover mission back to Earth.